So I am doing a swap on the timing belt. I ordered a new one from Nissan with a new water pump and both crank and cam seals. I had to order the tensioner bracket non OEM because they don't make it anymore. Don't understand that one. But so here is the questions. 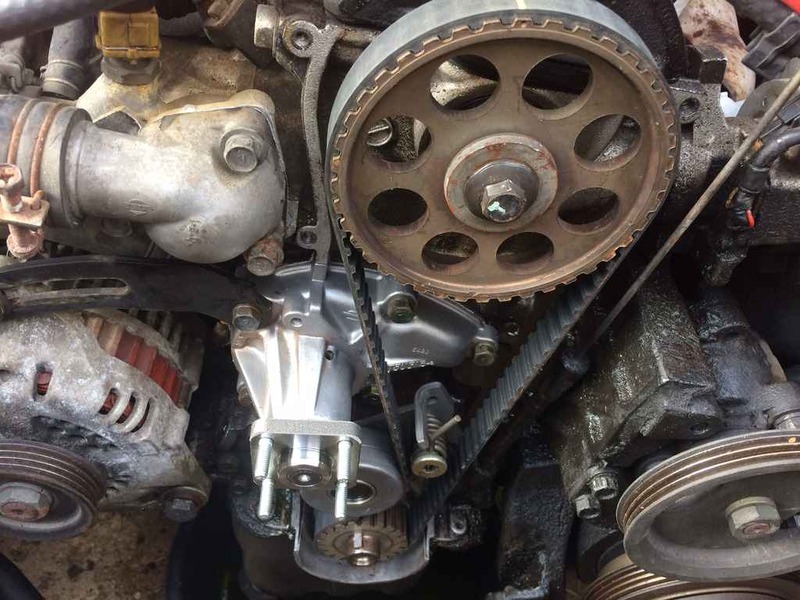 Can I replace the crank seal with just the crank pulley and timing belt gear removed? Any of you guys do this before? What is the best way to replace that or should I even mess with that? Right now I have everything off. 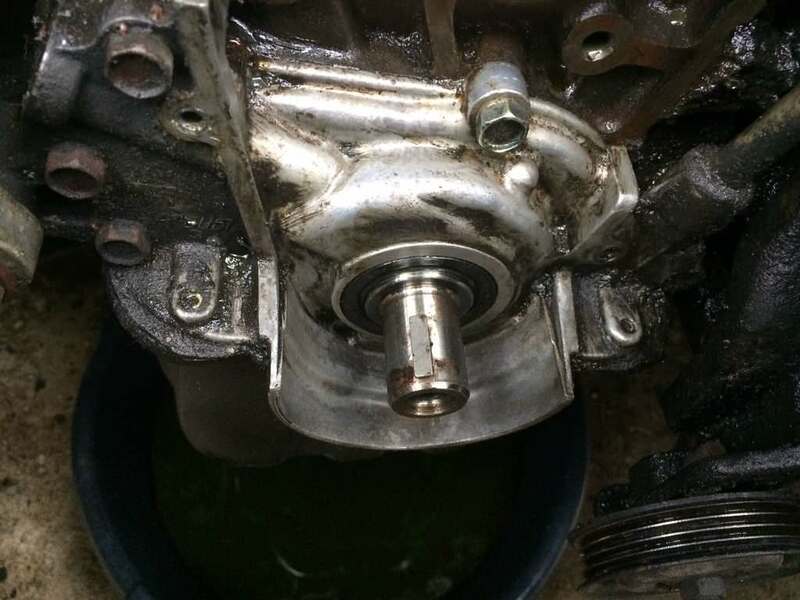 It looks like that part of the block with the crank seal can be unbolted separately but I think I would have sealing issues if I did that. I would rather just pull the seal out if I can. Pretty sure that's a no go. When I had an 18et torn that far apart I noticed oil weeping past the seal but couldn't see any way to replace it "externally". Pretty sure you'd have to flip it upside down and rip it open to change that seal. I am not sure about that specific engine, but if you can see the seal I have used this technique before. . . Use a small drill bit with a lot of sticky grease on it to sssslllllooooowwwwllllyyyy drill a couple of holes in the seal. The grease should catch the debris. Use a couple of screws with exaggerated thread like sheet rock screws to screw into the holes in the seal, then pull on the screws to work the seal out. It is not the right way but it can work. Can, not will. 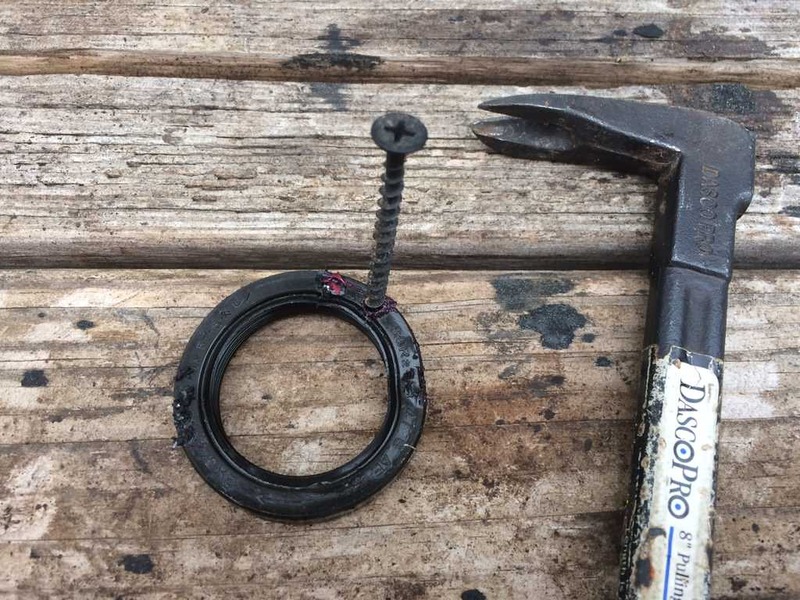 I have used this technique to remove seals a number of times with good success. It's always better to do it the right way when possible but alternatives are nice to have just in case. That sounds like a "screwdriver through the oil filter" level of desperation move. Good to know. Thanks for all the ideas so far. It rained here all day yesterday so did not have a chance to mess with it. Right now I am still at the cross roads of leave it alone and put everything back together or change it because I am right there with all the timing belt parts removed. Not far off. Desperate times can call for desperate measures though. iceageg, thanks for the tip. I tried the screwdriver method first and it did not work. I tried your screw idea and it worked perfectly. Timing belt changed and everything works. So new seals, new water pump, new thermostat, new idler pulley and timing belt. I will drive it a little while now before I rip into it again. I miss driving it. Here are some pics for someone doing this in the future. Awesome. I'm glad to hear it worked out for you. Hopefully you will be back on the road soon! Actually I am back on the road now. I drove it to work today. It ran great. The next step is the turbo. The original one is stuck. I have a new rebuilt one waiting for it. I just have to get the gaskets and figure out how to get the old one off and put the new one on. But before I do that I will drive it for a few weeks. Find some Mouse Milk for the exhaust bolts, start soaking them. If you can't find that stuff (aviation product) then I recall there are several penetrants that the guys on here swear by. Great job on the repairs! 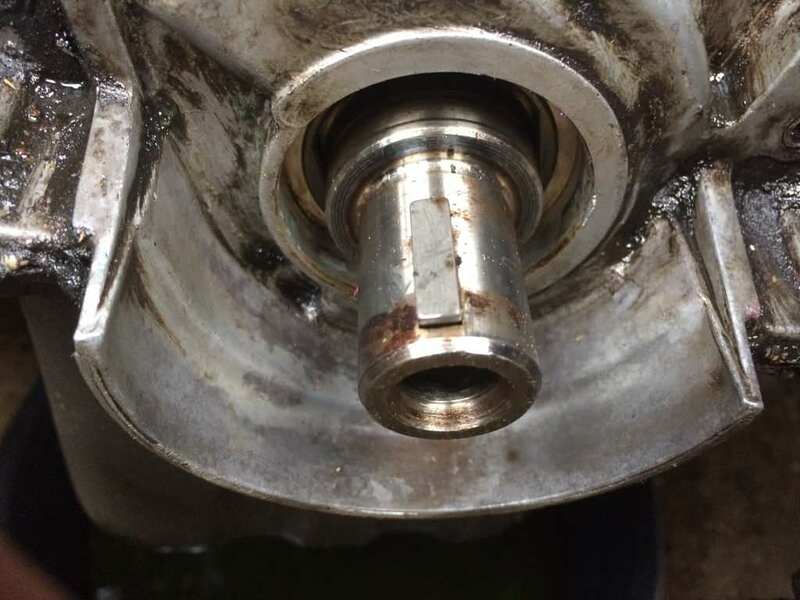 I did mine on the VG30, had to drill and tap the lower sprocket so I could use a puller to remove, had lots of rust down there! I used a seal puller I got from Harbor Freight, worked like a champ!